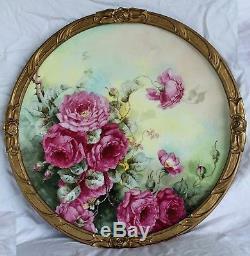 Breathtaking Large RARE 18 JPL Limoges Porcelain Plaque with HAND PAINTED ROSES OUTSTANDING Vintage French WOODEN Frame Museum Quality Masterpiece Limoges Roses Stunning Still Life Painting on Porcelain. 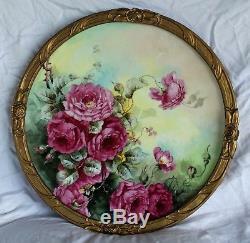 MORE PICTURES AND LAYAWAY IS AVAILABLE THROUGH OUR Rubylane shop. PLEASE IGNORE THE FLASH SPOTS - THIS IS NOT DAMAGE. 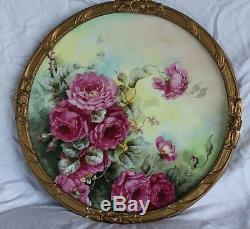 When I look at this plaque I can almost smell the roses they are so beautifully realistic!! 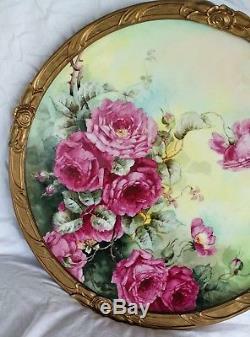 This piece is a HUGE 18" (in diameter) OUTSTANDING Hand Painted Porcelain Plaque painted with gorgeous Roses in dark multi-colors and FRAMED in an OUTSTANDING CARVED 19 1/2" diameter VINTAGE Wooden and Gesso FRAME. An exceptional dramatic rendering of the most beautiful Roses! 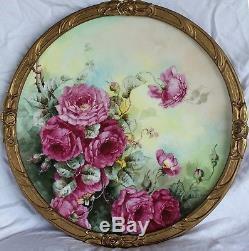 Both collectors and decorators will find this beauty a very desirable piece of Artwork and an excellent investment. This masterful portrait of gorgeous dramatic hand painted roses is true visual decadence, with so many variations of shadow tones, it is nearly impossible to describe each one. With every angle this masterpiece portrays a breathtaking still life palette. The artist has truly captured these wonderful roses in full bloom in a gorgeous bouquet. The leaves and branches are exquisite, painted in wonderful bold and brilliant shades. The gorgeous background shades are breathtaking You will definitely and absolutely be overwhelmed by this piece it is exceptional beyond words.............. A truly remarkable and outstanding piece to add to your collection. Please disregard the white spots, they are a reflection from the lighting used in photographing. Excellent condition with no chips, cracks, or crazing. 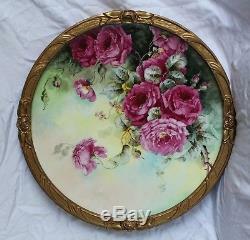 This most magnificent piece would be a incredible investment in your Limoges or other Hand Painted Porcelain Collection. Overall Porcelain Condition of this piece is EXCELLENT to MINT CONDITION no chips, cracks, hairlines, paint loss, or surface scratches. This is one not to miss! The photos don't do this justice! In the coming weeks we will be listing more wonderful items. You can subscribe to our shop to receive updates as we list new items. We are in the process of listing a very large collection of Antique Victorian items. 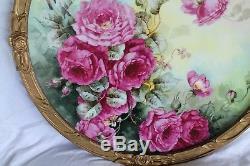 The item "RARE 18 JPL Limoges Porcelain Plaque with HAND PAINTED ROSES" is in sale since Sunday, July 8, 2018. This item is in the category "Antiques\Decorative Arts\Ceramics & Porcelain\Vases". 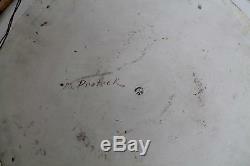 The seller is "victorian_antique_crazy" and is located in Brenham, Texas. This item can be shipped to United States.